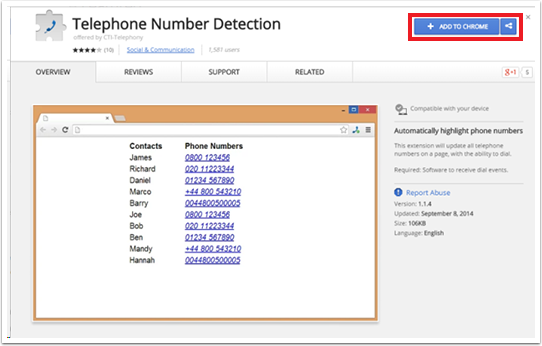 Level365 CRM Connect automatically installs two add-ons within the Internet Explorer browser: (1) "CTI Telephony Dialer" and (2) "Telephone Number Detection" which can be viewed and managed from the "Manage Add-ons" menu. 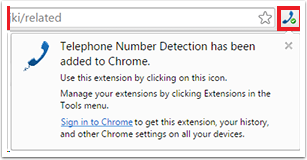 To download this extension, click the Download button and Google Chrome will open Chrome Web Store to provide you with the option to add "Telephone Number Detection" extension to your browser. Click on the ADD TO CHROME button. You will then be prompted with the confirmation message to have this extension in your browser. Click on Add. Chrome will now be able to identify numbers and convert them into hyperlinks that you can click and dial. 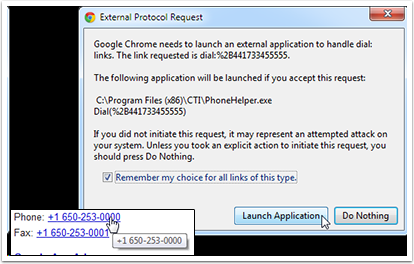 The first time you use web page dialing in Chrome, a window may pop up with a message about external protocols. Click the "Remember my choice for all links of this type" check box to prevent the message from reappearing and then click Launch Application to dial the number. An options screen can be accessed by right-clicking on the small blue telephone icon and then clicking the Options menu item. Click the Save button to store any changes or click "Defaults" to restore the settings to their default values. 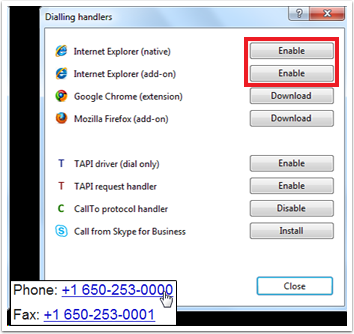 Dialing in Mozilla Firefox is achieved with the assistance of CTI-Telephony's "Telephone Number Detection" add-on which can be downloaded from the Dialing Handlers window. 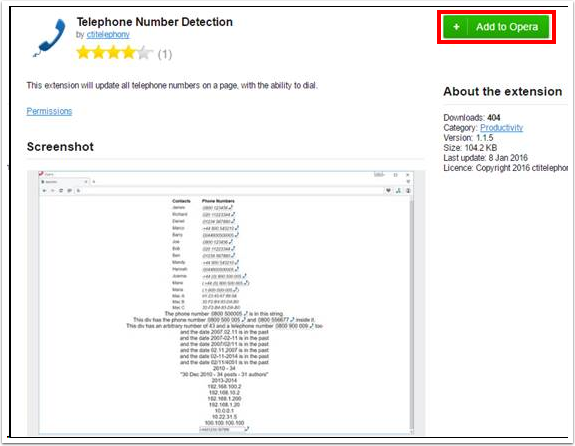 Click on the download button and Mozilla Firefox will launch Telephone Number Detection's "ADD-ONS" page. Click on Add to Firefox. Firefox will prompt you with a permission request to enable the Add-on. Click Add if you agree to the permissions (this is required to use the Add-on). A small balloon message will pop from the top-left corner of the browser telling you that the add-on has been added to Firefox. Click OK.
Click on the button in the top-right corner to reveal the main menu, then select the Add-ons option. A new tab will be opened that gives you access to the various extensions and plugins that have been installed. 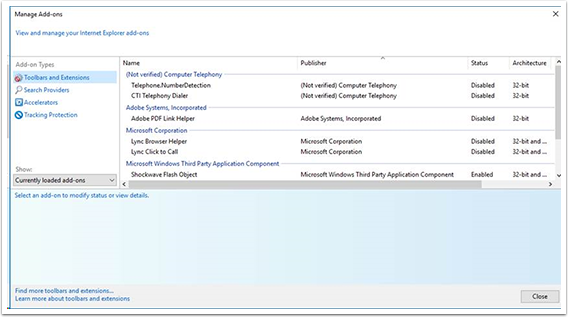 The files that make up the Telephone Number Detection add-on are already installed in the correct location so you don't need to install it but it may need enabling. 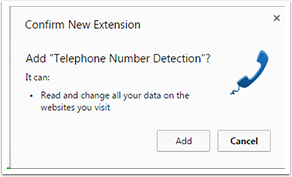 Click the Extensions option in the menu on the left-hand side of the "Add-on Manager" tab to display the list where Telephone Number Detection resides. Telephone Number Detection should be enabled by default. If the add-on's row is greyed out with an "Enable" button, then it is disabled. Just click the Enable button and then the Restart now button when prompted. Firefox will restart and dialing is almost ready to go. 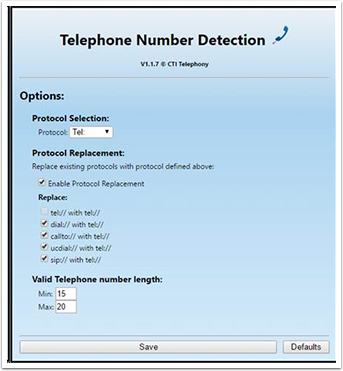 Once enabled, you can modify Telephone Number Detection's behavior and the appearance of the converted numbers by clicking the Options button which appears on Telephone Number Detection's entry on the "Add-on Manager" tab. 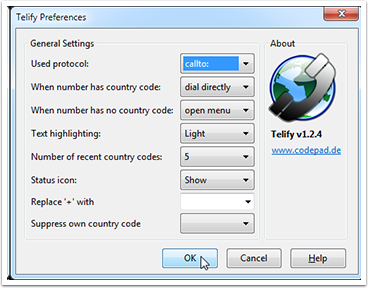 Make sure that "callto:" is selected in the "User protocol" dropdown box. 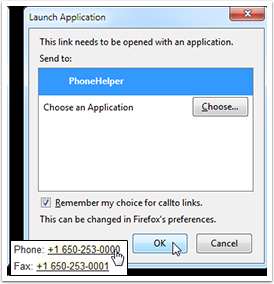 Click the PhoneHelper option in the "Send to" box and make sure the "Remember my choice for CallTo links" check box is checked as in the picture below. This is to prevent the message window appearing in future. Click the OK button to save the settings and dial the first number. To enable the Telephone Number Detection quickly, you will now see a shortcut icon on the task tray menu. To download this extension, simply click on the Download button and Opera will open Opera add-ons to provide you with the option to add "Telephone Number Detection" extension to your browser. Click on Add to Opera button.